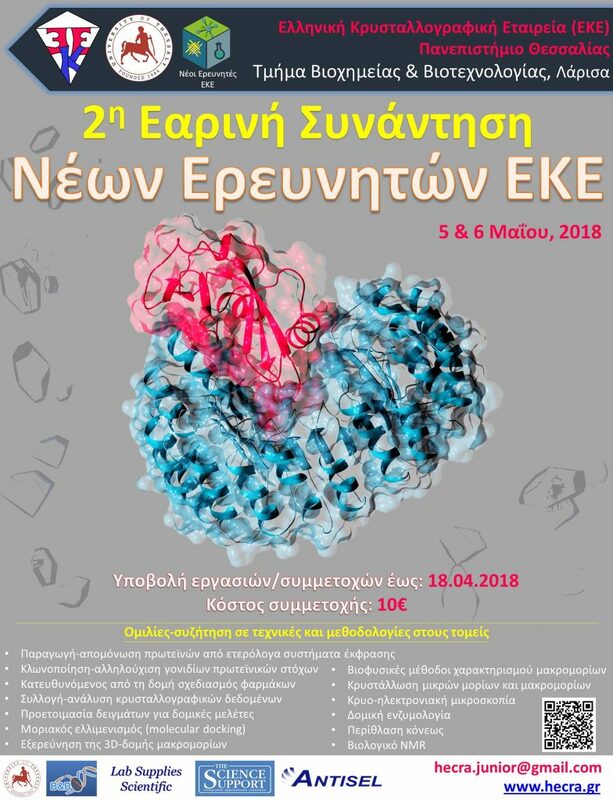 On Saturday 5th and Sunday 6th May our company will be honored to sponsor the 2nd International Hermes Meeting of Young Researchers of the Hellenic Crystallographic Society to be held at the Department of Biochemistry & Biotechnology of the University of Thessaly. 1. Preparation of small molecule samples for structural studies. 2. Crystallization of small molecules – Data collection and analysis. 3. Cloning / sequencing of the proteins of target genes. 4. Production / isolation and purification of proteins from heterologous expression systems. 5. Preparation of macromolecular samples for structural studies. 6. Macromolecular X-ray crystallography – Data collection and analysis. 7. Biological NMR – Data collection and analysis. 8. Cryo-electron microscopy – Collection and analysis . 9. Powder counting – Data collection and analysis. 10. Biophysical methods for characterizing macromolecules in the solution (SAXS, DLS, etc.). 11. Exploring the 3D structure of macromolecules. 13. Drug design directed by the structure. 14. Molecular docking (molecular bonding).